This excerpt is from the upcoming book The Sprinters Compendium, due to be released one day not too far in the distant future. >> Click here to download the entire 37 page (4.4Mb) free excerpt in PDF of Chapter 3. When explaining the step pattern for the 100meter dash and how one should attack it, I use the analogy of a basketball spinning on my finger. Pretend the surface of the basketball is like the surface of the track. Your hand, as it pushes the basketball on your finger is like your feet. As you start to spin the basketball your hand uses long firm strokes, similar to the powerful steps we want out of the acceleration pattern. As the surface of the basketball (or track) speeds up so must your hand. This mimics the patter of stride frequency increasing through the acceleration phase. At some point, your hand and basketball cannot spin any faster, and now you have reached Max Velocity. At the point of terminal velocity, the timing of your hand strikes is important or the ball will fall off your hand as it slows down and loses balance (deceleration). Therefore, we must have quick hand strokes, just as the stride pattern must maintain a high frequency at the end of a race. Kids understand this idea. I got this trick from a USATF clinic video a long time ago. We have all coached athletes that have struggled with their start or coming out of the blocks. As sprint coaches, we are obsessed with the topic of block setup. Every clinic I have gone to have the topic of block setup and block starts as a key component. 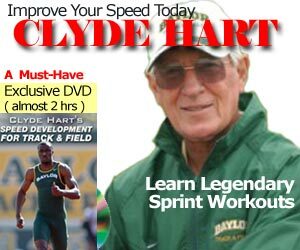 First, it is imperative to know that some sprinters are always going to battle the “bad start” disease. The biggest problem with a bad start disease is a lack of strength. No matter how much you drill, practice, or watch videos of starts if your athlete does not have the necessary power they will struggle out of the blocks. (In later chapters will discuss how to address strength issues in the weight room.) 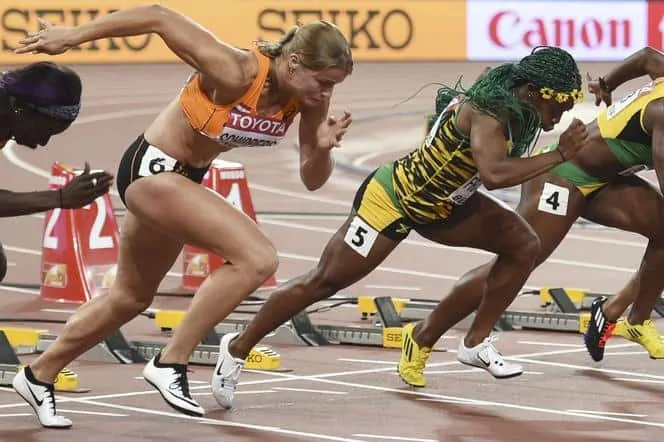 Another factor is body structure issues such as an athlete’s height, and limb length which can play a significant role in what needs to happen in the blocks for athlete to maximize their start. A block start for Usain Bolt is going to look a lot different than a block start Maurice Green. Prior to addressing strength issues and adjustments based on body structure, your athlete needs to learn how to set their blocks. At a young age, I was taught improperly how to set up and come out of blocks. It took until my college years with the help of the internet to realize what I had been doing wrong for so long. Due to my personal experience as a sprinter and now as a coach, I feel it’s important for every coach to have a basic explanation for a universal block setting. The first thing we do when an athlete enters our program is watch them move from point “ A” to point “B” from a standing start. We do not tell the new athletes what we are looking for, or give any instructions. This is so we can get an honest run from our sprinters and correct their natural movements. As the Sprinter is doing this, we try to pay attention to which foot is the quick leg and which foot is their power leg. The quick leg should be the leg that takes the first step, and the athlete should put that foot back before they sprint forward. The power leg is placed in the front block and tends to be the leg that stays to stay contacting the ground longer, spending more time pushing, and leaves second from the starting position. After a couple observations, we then double-check our findings by having the athlete stand in front of us facing the opposite direction. Once in position, we push them firmly in the middle of the back to see which leg wants to leave first (quick leg) and which leg wants to stay in position (power leg). After taking the test into consideration, we then put the athlete’s quick leg farther back in the blocks and the power leg more toward the front of the block. Often times the leg that is opposite of their writing hand is their power leg (front leg in the block). If this clue does not work, have the sprinter pick up a basketball and take a layup at the hoop. The leg that drives first from the ground will be the quick leg. The leg that stays on the ground longest is the same leg the sprinter will on the front paddle of a block start as their power leg. Going through these steps may seem redundant, but some sprinters are ambidextrous, or their parents tried to change their dominant hand as a little kid (like my grandparents did to my father). After you know the position of their front and back legs, it is time to set the block on the track to correctly establish the placement of the pedals. The front of the actual block should be one shoe length back from directly behind the starting line (Figure A). Then, with the block now placed at the proper distance from the starting line, the sprinter should measure two shoe lengths from the back of the start line to the front pedal (Figure B). The back block pedal will be set three shoe lengths from the back of the start line (Figure C). Now the athlete has a starting point for setting their blocks, and individual adjustments can be made.